Mopar Fiat 500 | What Car? For those who don't know, Mopar is short for Motor Parts and, among other things, it produces aftermarket accessories and performance versions of Chrysler products. Now that Fiat part-owns Chrysler, and is using its dealer network to launch the Fiat 500 in the USA later this year, the Mopar tuners have had a go at the supermini. 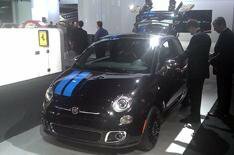 The result is this the Mopar Fiat 500. Its at the Detroit motor show finished in black satin paintwork with a blue stripe decal running across its bonnet and roof, plus an overload of chrome, including touches on the exhaust, door mirrors and grilles. Inside, changes include a faux carbonfibre handbrake and gearlever, and black and blue leather seats. Performance-enhancing modifications include the addition of a suspension strut brace, to improve stiffness. The car is intended to showcase what Mopar can do rather than as a bespoke special edition, so expect a raft of add-ons to be offered for the Fiat 500 in future.